Today’s gospel proposes a sly and devious character as our anti-hero. There is no indication that the dishonest steward actually turned over a new leaf nor could his actions be considered altruistic. In fact, self-preservation would seem to be his primary motive. In this sense, the parable is possibly the most mysterious of all Jesus’ parables. Here we have a steward, a sort of manager, entrusted with the business of the owner but guilty of mismanagement. Believing that his services would soon be terminated, he moves to secure his position. To cushion himself with a ‘soft-landing’ in the event he gets fired, he devised a dishonest yet clever plan. The plan was to under-invoice goods that clients had bought, so that those clients would be morally indebted to him and would pay him back by dealing with him favourably when he was out of a job. Although the unscrupulous action of the steward immediately catches our attention, it is not the main lesson to be drawn from this parable. Some interpreters, embarrassed by the scheming and underhanded methods of the steward, have proposed that the discounting of debts could have come out from the steward’s own generous commission. But even the most charitable explanation of the steward’s modus operandi would not lessen the paradox of this parable. Why is a steward commended for astuteness by reducing the debts of his master’s debtors, seemingly squandering his master’s property still further? Furthermore, should a dishonest man be even held up as an example for moral virtue? For these and other reasons, no explanation of this parable seems wholly satisfactory. But it is clear, that the Lord is not asking us to emulate his dishonest ways. The main lesson has to do with his astuteness in averting disaster and securing a future. The word “astuteness” is a translation of the Greek adjective ‘phronimos,’ which is derived from the noun ‘phronesis,’ It refers to the art of being discerning and judicious i.e. exercising smart judgment. A person who possesses ‘phronesis’ has the ability to both figure out what to do in any given moment while also knowing what is worth doing. The same word is used to describe the action of the man who built his house on a rock (Matt. 7:24). You could say that it's something like common sense, but it is really more than that. What ‘phronesis’ means is practical wisdom whereas ‘sophia,’ the other Greek word, speaks of theoretical wisdom. Such practical wisdom was seen, by ancient Greek philosophers, as a necessary part of the life of virtue. In the mind of Socrates, for example, ‘phronesis’ equals virtue, they are the same thing. Being good, according to Socrates, is to be intelligent. According to St Thomas Aquinas, who translated the works of Aristotle, ‘phronesis’ is translated as prudence. 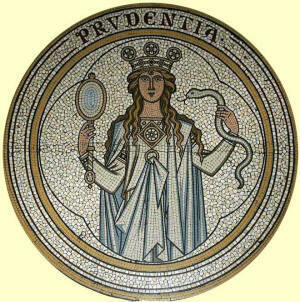 Just like the Greeks, prudence was considered by St Thomas Aquinas as the cause, measure and form of all virtues. It is considered to be the auriga virtutum or the charioteer of the virtues, the mother of all virtues. The function of prudence is to point out which course of action is to be taken in any concrete circumstances. It lights the way and provides the parameters where other virtues are exercised. Its office is to determine for each in practice those circumstances of time, place, manner, etc. which should be observed. For example, a prudent man might see an old lady on a crowded Light Rail Train and a young man occupying a seat reserved for the elderly and disabled. He may prod the youth to encourage him to give her a seat, even at the risk that the young punk may turn around and assault him. But this is when we are reminded that prudence is never about self-preservation, it is a moral virtue. It does not serve its own interest but always the interest of that which is True, Good and Beautiful. Therefore, the prudent man, is one who grasps a critical situation with resolution, foresight, and possesses the determination to avoid serious loss or disaster. He then acts virtuously. If foresight is the true measure of intelligence, a Christian must be ‘super’ intelligent since his foresight extends beyond this temporal plane, it penetrates the veil of death and catches a glimpse of the eternal vision of glory. As the dishonest steward responded decisively to the crisis of his dismissal due to his worldly foresight, so disciples are to respond decisively in the face of their own analogous crisis with heavenly foresight. The greater crisis is not economic or even relational in nature; it is the ever-present prospect of death. Jesus is concerned here with something more critical than a financial crisis. His concern is that we avert spiritual crisis and personal disaster through the exercise of faith, foresight and compassion. If Christians would only expend as much foresight and energy to spiritual matters which have eternal consequences as much as they do to earthly matters which have temporal consequences, then they would be truly better off, both in this life and in the age to come. Real wisdom is acknowledging that worldly happiness and success cannot be the key indicators of a wholesome life, a self fulfilled life but rather as St Ireneaus indicates, “the glory of God is a man fully alive.” Wholesomeness is measured by the extent of how we live our lives for the glory of God, and not for ourselves or for things. Finally, being astute means recognising that there is no contradiction between faith and reason; in fact ‘faith seeks understanding’ (fides quaerens intellectum). We should, therefore, resist the temptation of dumbing-down the message of Christ, to reduce the gospel to the level of compatibility with the values of the world. Many worldly values will always remain incompatible with that of the gospel. Catholics need to recover the courage to be deeply reflective in our theology, rooted in our catechism, and intellectual in the defence of our faith, rather than giving in to a shallow mushy version of religion and styles of preaching done in the name of that most abused concept of all, ‘pastoral reasons.’ In fact, “the greatest pastoral disaster is the dumbing down of our Catholic faith” (Fr Robert Barron). I’m tired of hearing the excuse for pitifully shallow catecheses, because it is claimed that our lay Catholics won’t be able to grasp and understand the depth of Catholic theology and teachings, so they always need to be served bite-sized, dumb down versions of the original. I think that’s down right condescending. Often, people fail to understand not because they are obtuse but because they choose not to understand. The issue has less to do with intelligence than with sin which blinds and obscures. We therefore need to move beyond the idea that graduating from Sunday school or receiving Confirmation prepares us with everything we need to know about our faith. Personally, I went through 12 years of Catechism in a Catholic missionary school and eight more years of seminary training, and I know I still have room to grow and learn. It would be presumptuous and dangerous for me to claim that I have nothing more to learn. As disciples of the Lord, we are constantly prodded to go the extra mile, to make the ultimate sacrifice of bearing the cross. The world would consider us fools for this. But today’s gospel reminds us that there is nothing foolish about our choice or decisions. In fact, we have to exercise prudence above all. Without prudence bravery becomes foolhardiness; mercy sinks into weakness, and temperance into fanaticism.